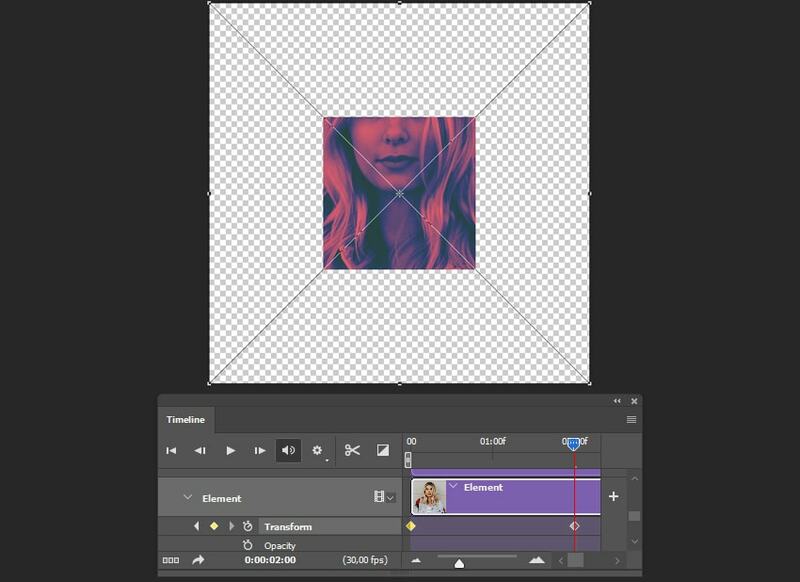 In this tutorial, we will use Adobe Photoshop to create an animated photo reveal effect for Instagram, which can be used with any image. 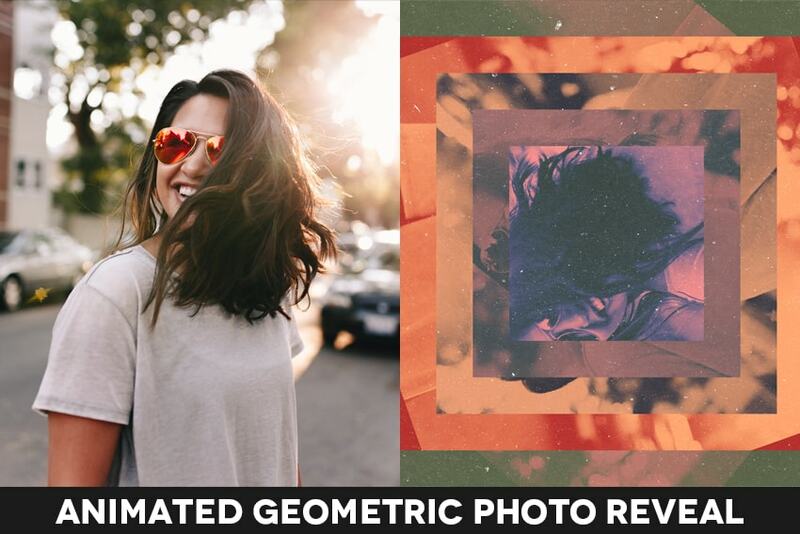 You can also check my Animated Geometric Color Reveal Actionwith different animated textures and effects,createdthe same way for myGraphicRiverportfolio. Any photo you want to use for this manipulation. You can find some free photos onUnsplashandPixabayor buy high-quality photos onPhotoDune. I chose this photo from Unsplash. UseControl-Nto create a new document and use thefollowing settings:1080 x 1080 px; 300 dpi. Go toFile>Placeand put your image inside the document. Now we need to convert our image to a smart object.Right Clickon the layer, and then selectConvert to Smart Object. 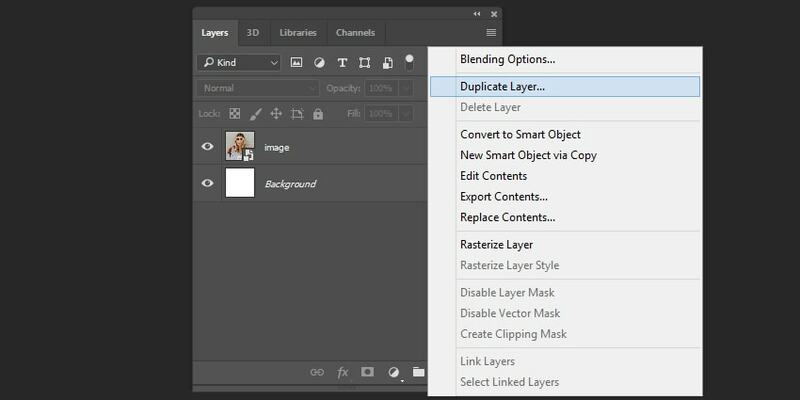 After that, let’s create a duplicate of the smart object:Right Click > Duplicate layer. Create four more duplicates of the smart object as we did before. After that, you can easily change the image in all the smart objects just by replacing the photo in the first smart object. Now let’s create the shapes for our template. Hit U to create a Rectangle Shape and use the following settings: Width: 432; Height: 432. After that, create the second shape with the following settings:Width: 594; Height: 594; No Fill; Stroke: 81 px. Create the third shape with the following settings:Width: 756; Height: 756; No Fill; Stroke: 81 px. Create the fourth shape with the following settings:Width: 918; Height: 918; No Fill; Stroke: 81 px. For the last shape, let’s use these settings:Width: 1080; Height: 1080; No Fill; Stroke: 81 px. 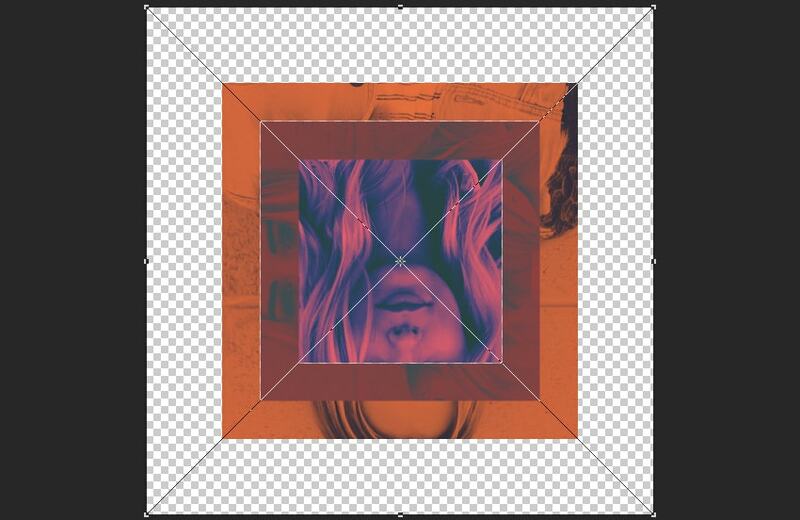 Hit V and select all the shape layers, and then click Align Horizontal Centerand Align Vertical Center. Now we need to move each shape below each smart object. 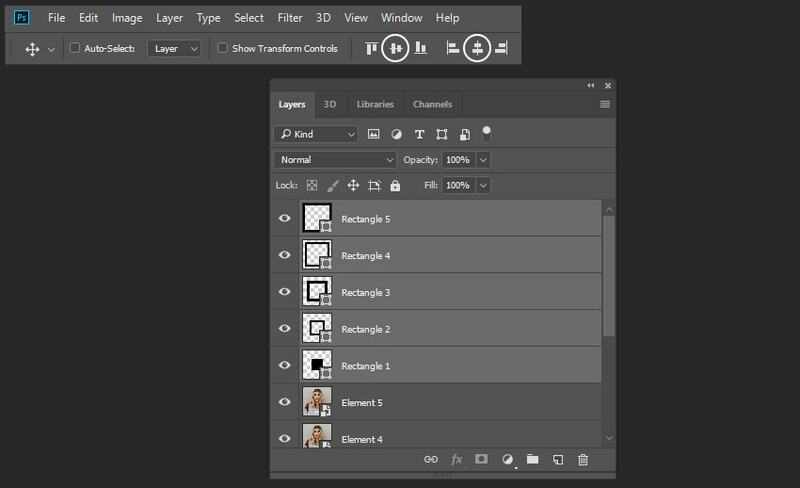 Make the main smart object and the background layer invisible. 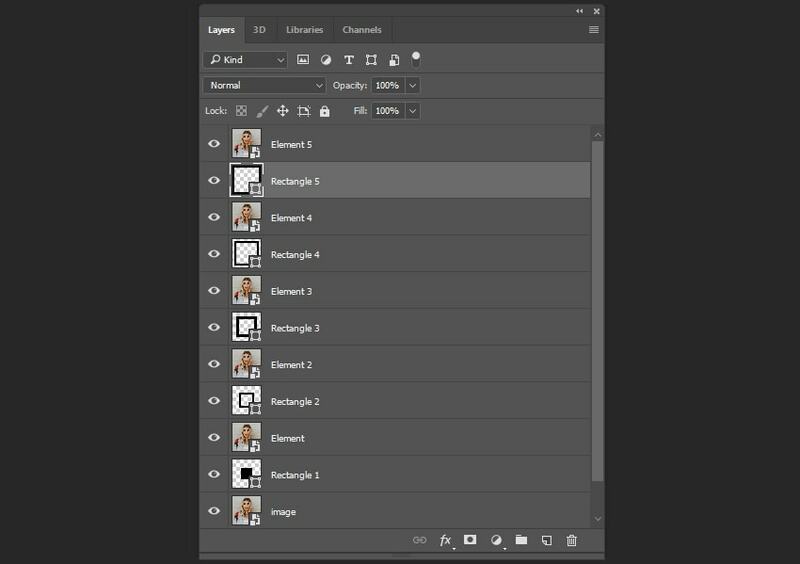 Now select the first smart object andRight Click > Create Clipping Mask. 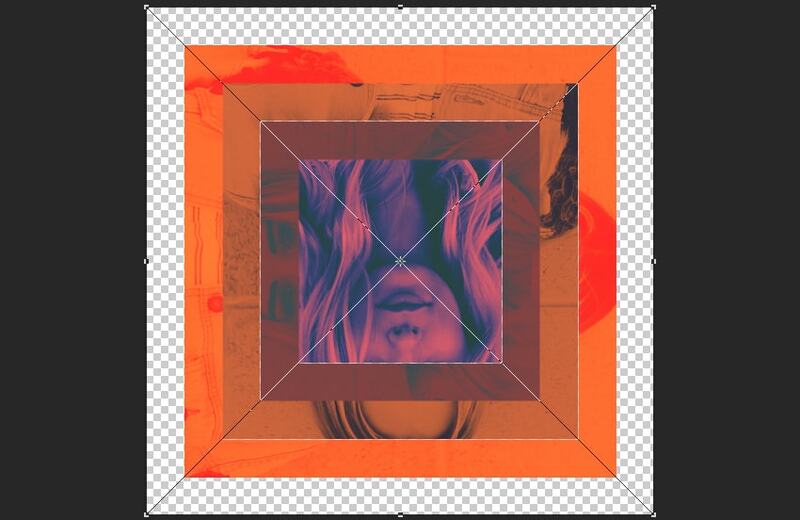 Create a clipping mask for each smart object using the same method as before. 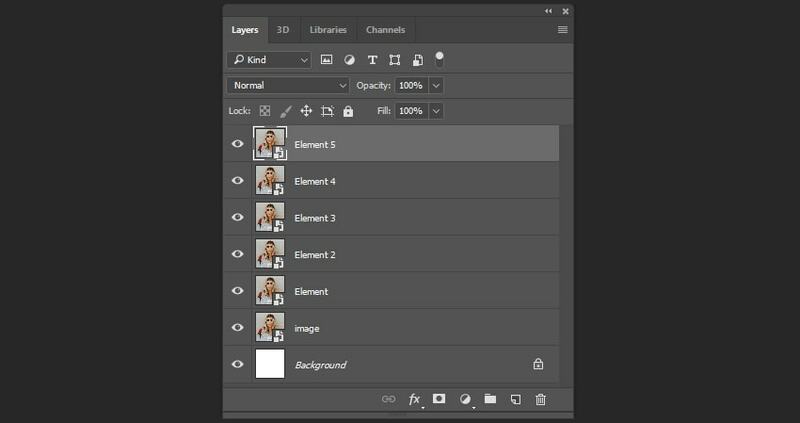 To make it easier for us to work with our layers, we need to create groups of layers. 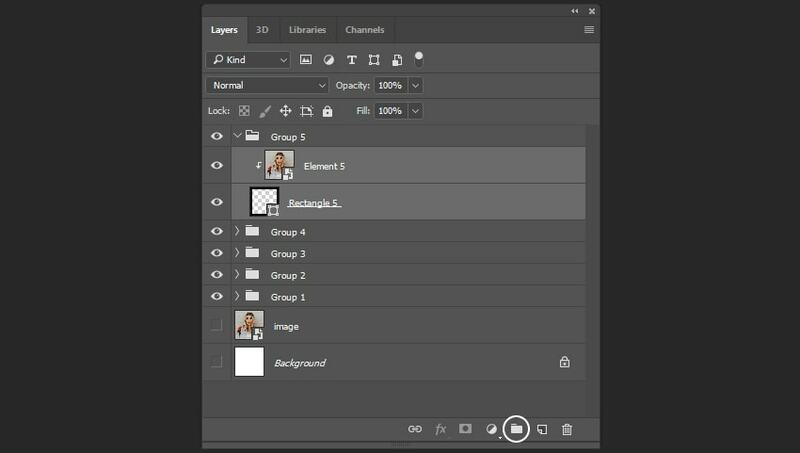 Select each smart object and shape and then hit theMake a Group icon. To create a black and white filter, we will use a gradient map. 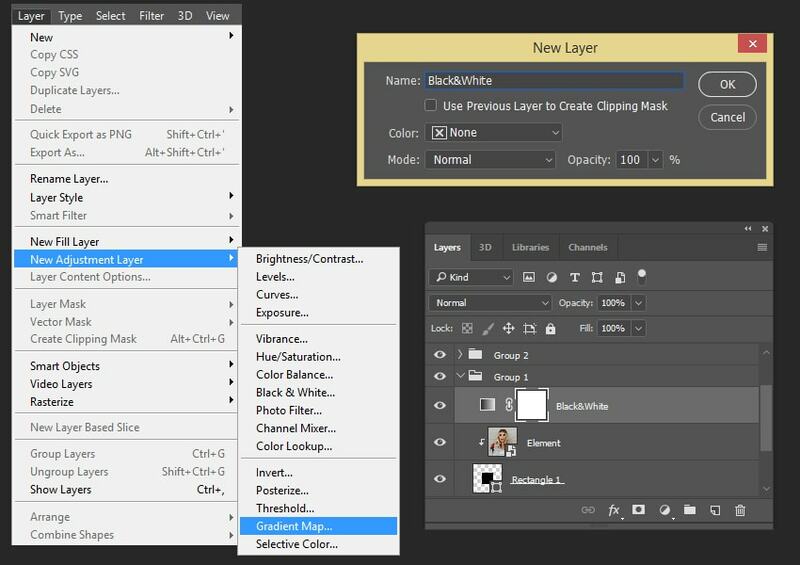 Select the first smart object and go to Layer > New Adjustment Layer > Gradient Map. 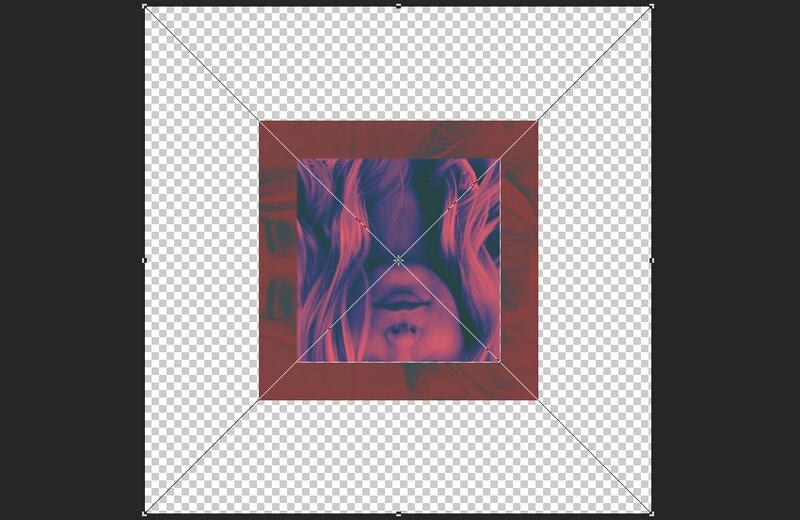 After that,Right Click > Create Clipping Mask. Now create another gradient map above, but use the following colors: #21382e; #3d3b6d; #fd605b. 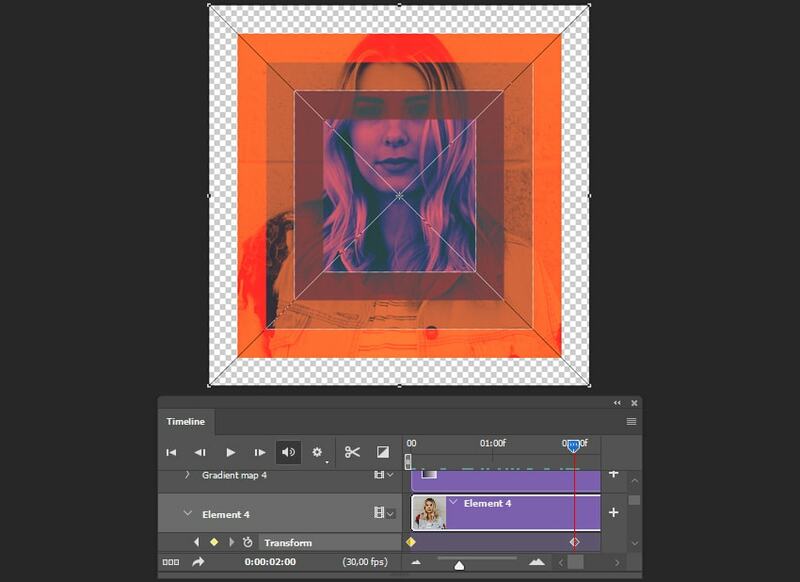 Select the gradient map layer and create another clipping mask. 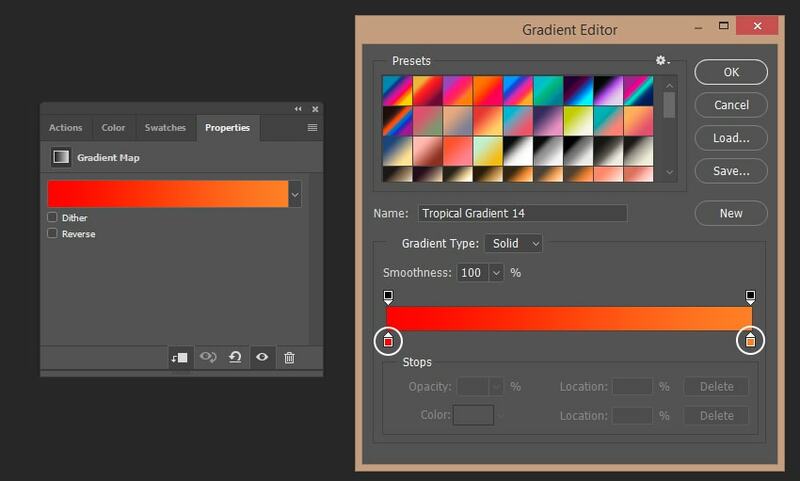 Create another gradient map with the clipping mask in the second group with the following colors: #31444b; #843332. 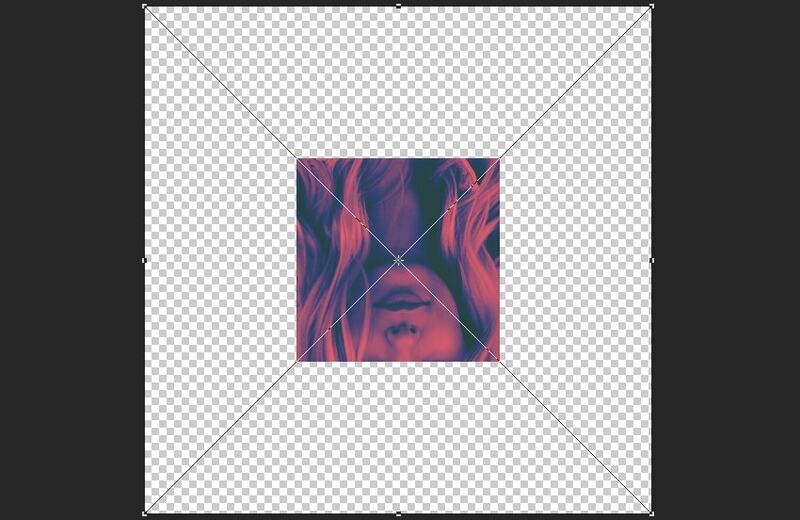 Now let’s create another gradient map with a clipping mask as we did before, but for the third group of the layers. For this one, let’s use the following colors: #16172b; #df7136. For the next group of layers, use a gradient map with the following colors: #dd0a00; #fe7f32. 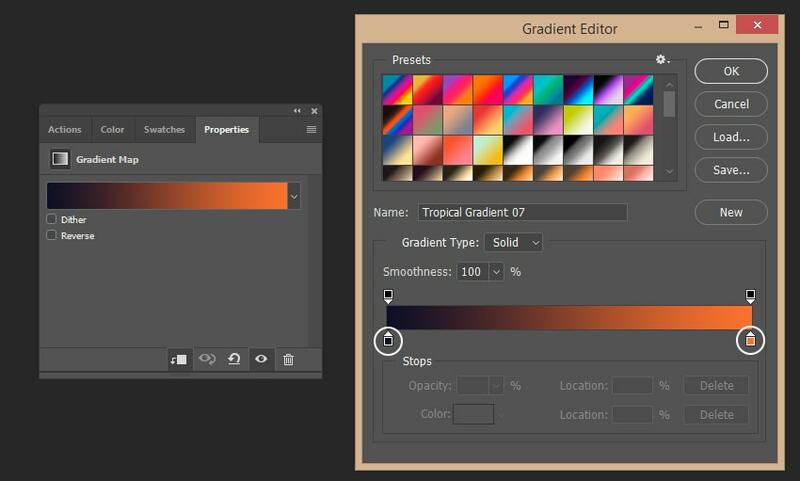 For the last group of layers, use a gradient map with the following colors: #5b673f; #a23c2d. Now we need to make our image look a bit faded. 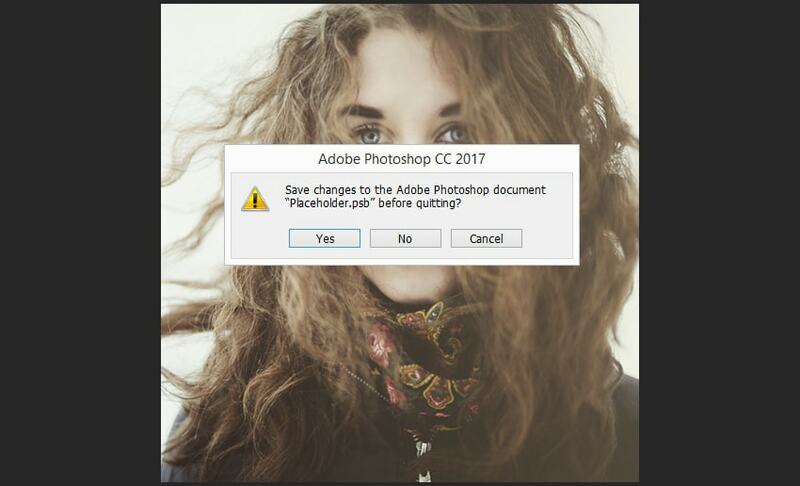 Go to Layer > New Adjustment Layer > Exposure and use the following settings: Offset: +0.0200. 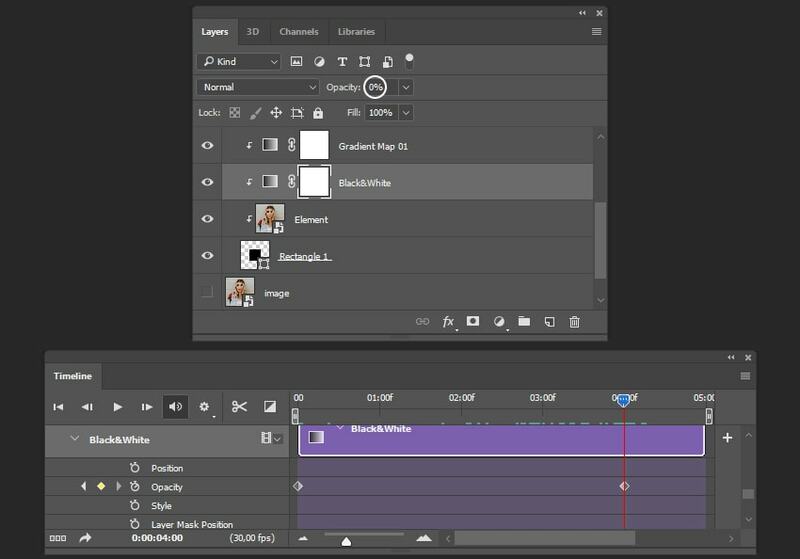 To start creating the animation, go to Window > Timeline and then hit Create Video Timeline. 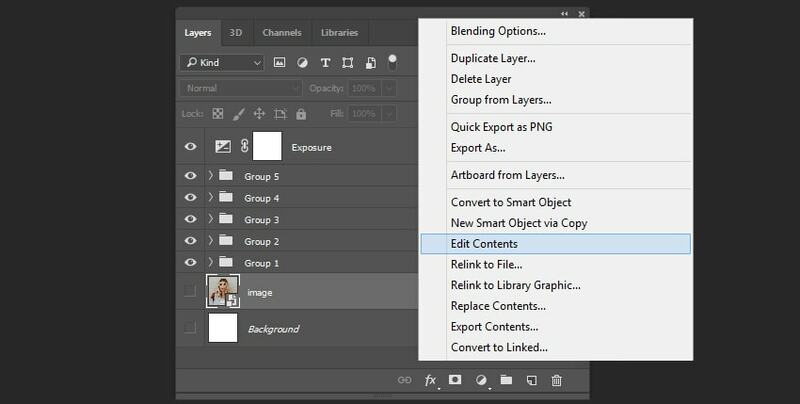 Select the smart object in the first group of the layers, pressControl-T, and rotate the image -180° whileholdingShift. 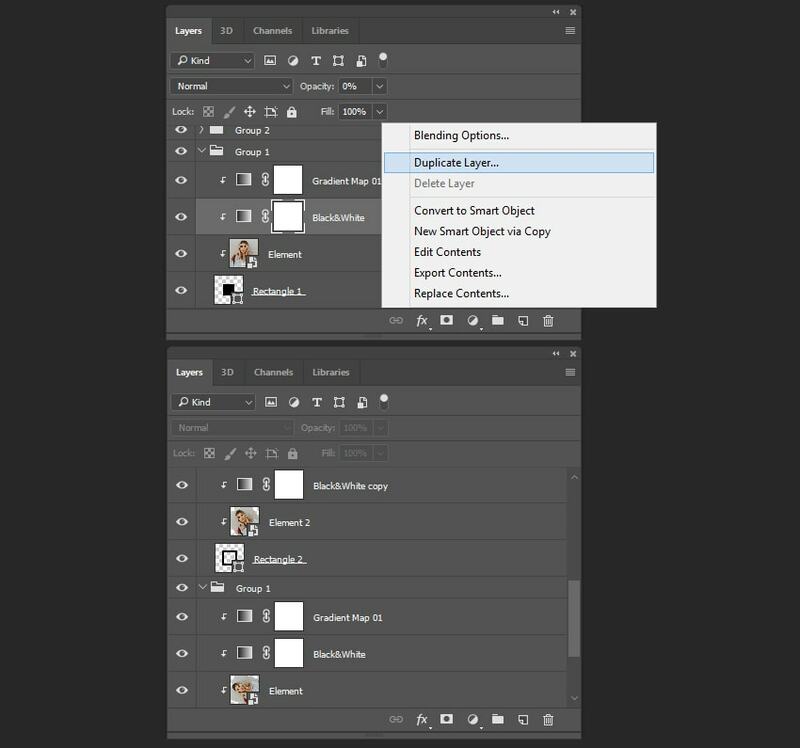 Select the smart object in the second group of the layers, and then pressControl-Tand rotate the image-90°whileholdingShift. Select next smart object in and then pressControl-Tand rotate the image-180° whileholdingShift. 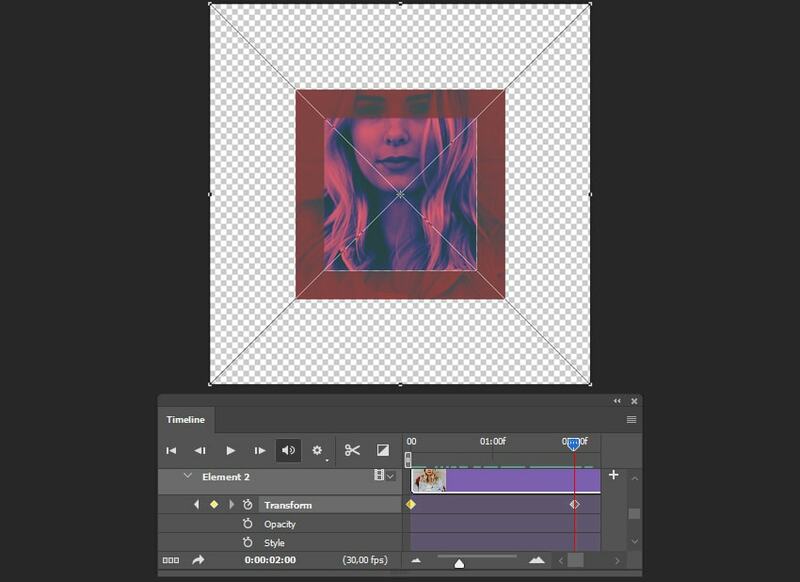 Select the smart object in the fourth group of the layers, and then pressControl-Tand rotate the image90°while holdingShift. Select the last smart object, and then pressControl-Tand rotate the image-180°while holdingShift. 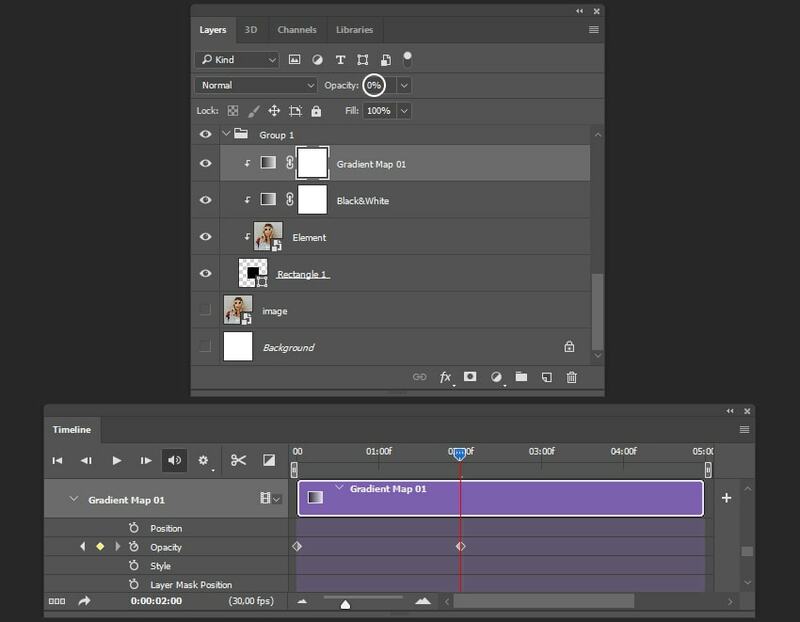 Open the first smart object in theTimelinepanel and move theTime Indicatorto0:00:00:00.After that, click on the Timer icon near the Transform to create the first Keyframe. Move theTime Indicatorto0:00:02:00,and then rotate the smart object180° whileholdingShift. Open the second smart object in theTimeline paneland create the first Keyframe at0:00:00:00. Move theTime Indicatorto0:00:02:00and rotate the smart object90° whileholdingShift. Open the next smart object in theTimeline paneland create the firstKeyframeat0:00:00:00. Move theTime Indicatorto0:00:02:00and rotate the smart object180° whileholdingShift. Open the fourth smart object in theTimelinepaneland create the firstKeyframeat0:00:00:00. Move theTime Indicatorto0:00:02:00and rotate the smart object-90° whileholdingShift. Open the last smart object in theTimelinepaneland create the firstKeyframeat0:00:00:00. Move theTime Indicatorto0:00:02:00and rotate the smart object180° whileholdingShift. This is how the animation should look after the manipulations listed above. Now we need to create an animation for the color effects. Open the black&white filter in the Timeline panel and move theTime Indicator to 0:00:00:00. 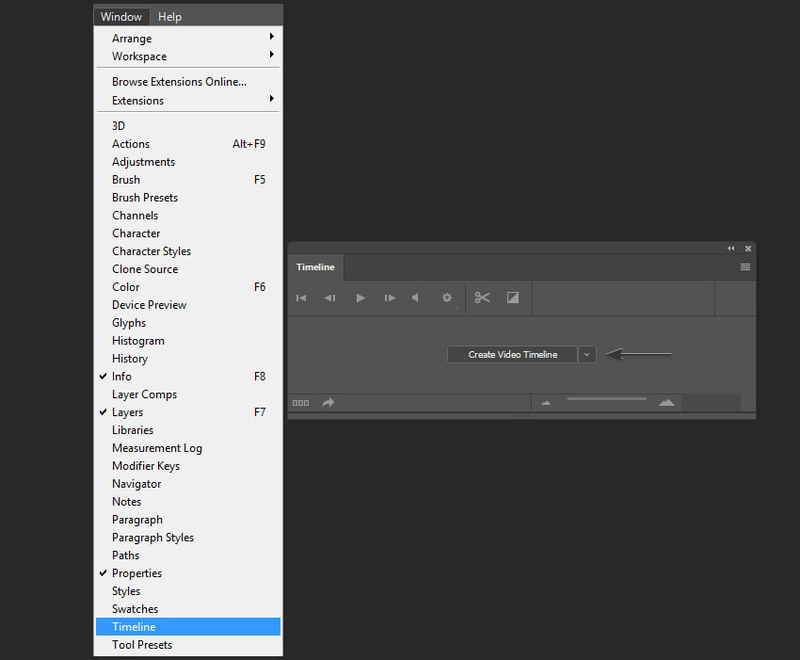 After that, click on theTimer icon near the Opacity to create the first Keyframe. Move theTime Indicatorto0:00:04:00 and change the Opacity of the layer to 0% in theLayers panel. 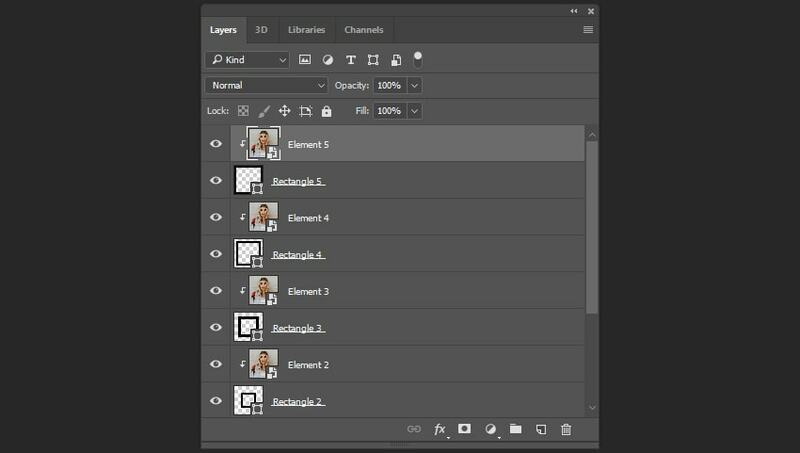 Duplicate this layer four times using Right Click > Duplicate and place each duplicate of the filter above each smart object. 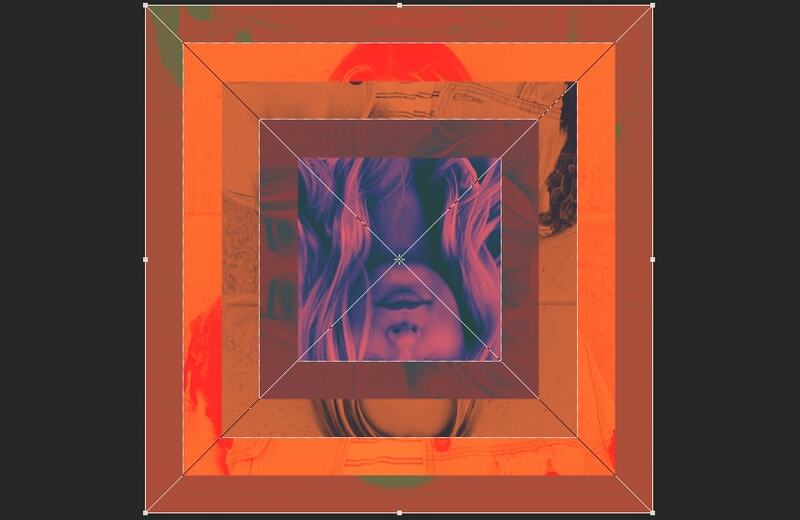 The animation of this layer is copied along with the layer. 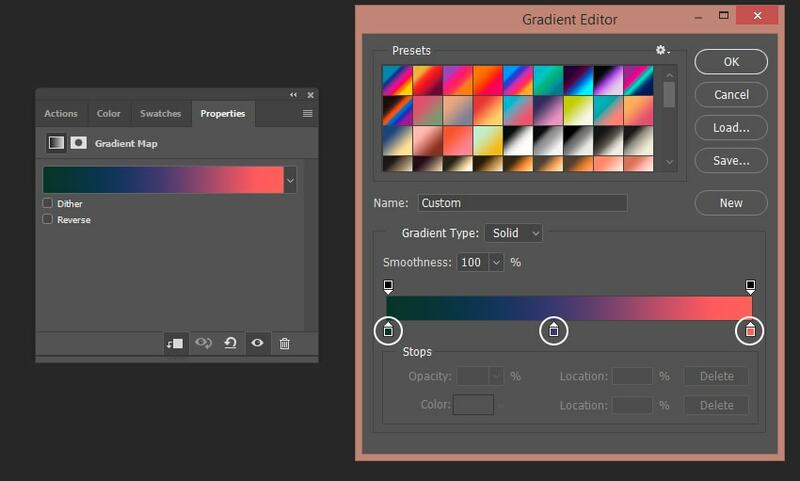 Select the gradient map in the first group of layers and then move theTime Indicatorto0:00:00:00. After that, click on theTimericon near theOpacityto create the firstKeyframe. Move theTime Indicatorto0:00:02:00and change theOpacityof the layer to0%in theLayerspanel. Now we need to copy the keyframes. 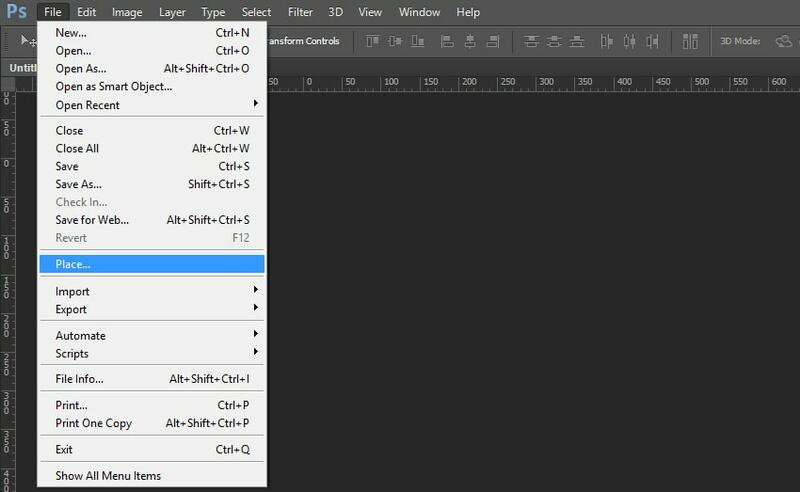 Select two Keyframeswhile holding Control,and then hit Copy. 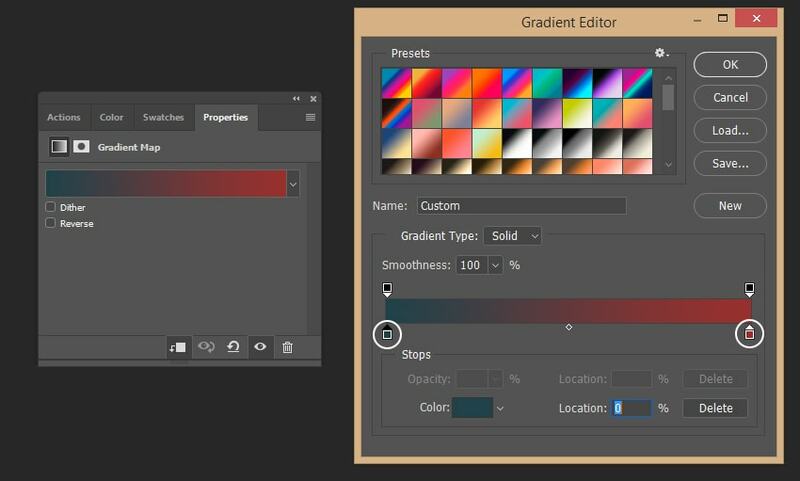 Open the gradient map in the next group of layers. 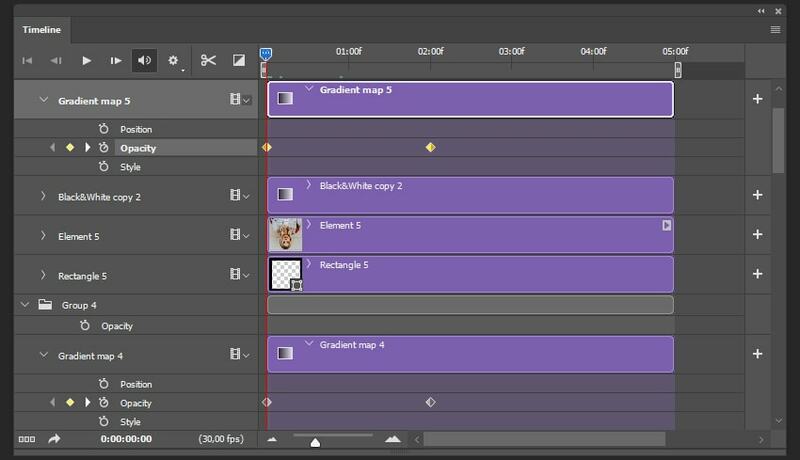 After that, click theTimericon near theOpacity in the Timeline panel, andRight Click > Paste. 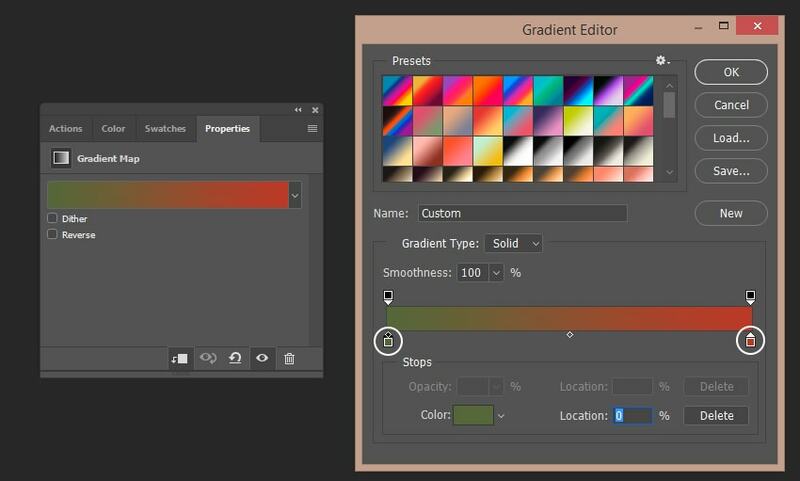 Now let’s create copies of the keyframes for all gradient maps, as we did before. To save your animation for Instagram, you need toclickon the icon intheupper right corner and selectRender Video. 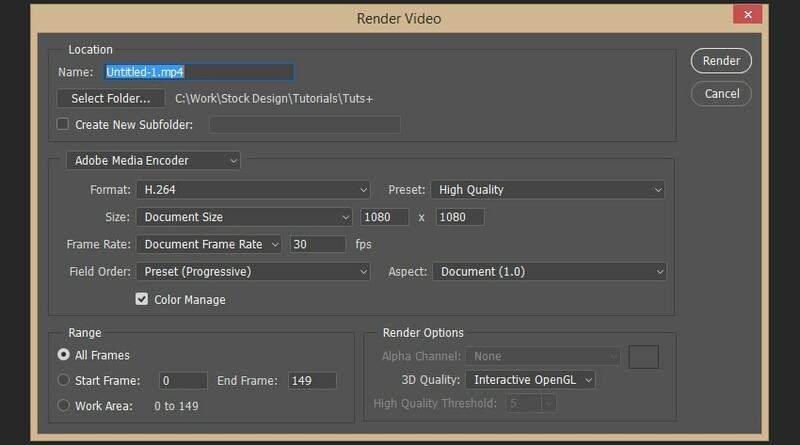 Set the following settings in theRender Videopanel:Format: H.264; Size: Document Size; Range: All Frames. If you want to change the image used for your animation,Right Click > Edit Contentson the smart object which we created first. Place your new image above the old one, pressAlt-F4toclosethe placeholder, and then selectSave. Awesome Work, You’re Now Done! 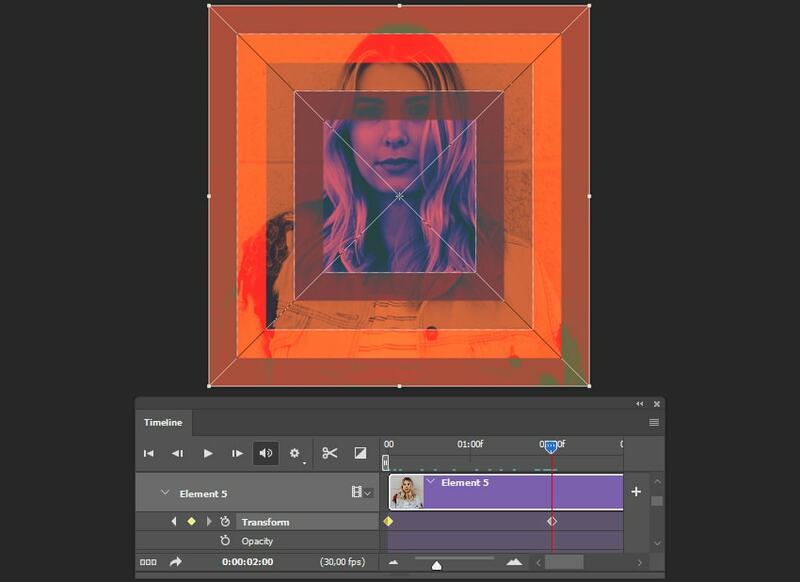 In this way, we can create an animated template in Adobe Photoshop using smart objects. I hope you’ve enjoyed this tutorial, and feel free to contact me for any help with the tutorial. You can also check myAnimated Geometric Color Reveal Actionin my portfolio onGraphicRiver. Design creative apparel with t-shirt template mockups. Check out this selection of high-quality templates from PlaceIt and ThemeKeeper Elements. Welcome back to our Diversity in Design series on ThemeKeeper Tuts+. Discover four talented artists with inspiring styles you’ll love.